Abstracts will be accepted from projects, policy and practice, evaluations, and research globally. Abstracts should be concise with clear lessons and should not keep readers in suspense. Clearly defined population and climate issue, problem or hypothesis at the beginning of abstract. Information used can have a global perspective but lesson for Africa must be clearly stated. The abstract should have a precise title (15 words max), and self-explanatory. Abstract must be grammatically correct, have clear outcomes, related to theme and logical conclusion. The results should demonstrate high level of innovation for lesson upscale. 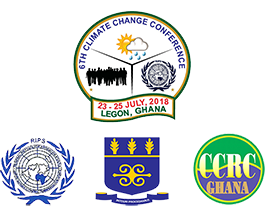 Abstracts with highest orientation to climate change issues in Africa preferred. The main text of abstracts must not exceed 300 words in simple, clear and non-technical language.